On Saturday 16th June the Circular Head Kart Club held its first Twilight meeting for 2018. Although only a small amount of entries and a cold and wet day, the action on track was on fire. In Cadet 9 positions were swapped across all three heats, and in wet and wild final was not different. With all drivers doing a great job to keep their karts on the track it was Mitchell Conroy that took the win followed by Rhys Jeffrey and George MacMillan taking out third position. The Grant McGlasson Memorial podium – 1st Daniel Hinds, 2nd Jorden Distill, 3rd Timothy Piper (absent). Cadet 12 was taken out my Denzil Sargent who drove very strong all weekend with Cooper Synfield taking second and in his first wet race meeting. William O’Grady stepped away with third spot. Ethan Wyllie and Logan Dixon enjoyed the wet track racing and provided some great racing in KA4 Junior. However in the final it was Wyllie that took the win over local boy Logan Dixon and Evan Chivers from STKC taking home third spot. A small field of KA4 Masters saw a very wet Clint Pease drive away with a win over Geoff Lawrence and new comer Mark Johnston. Louis Popwoski was the only KA3 Senior driver this weekend, but enjoyed mixing it with the Tag Restricted Medium Drivers. Tag Restricted was the feature class of the weekend with three different weight categories racing and coming together for a feature at the end of their three heats and final. In the Light class it was the Distill brothers of Matthew and Jordan that were the class of the field for the weekend. Taking out first and second in the final, they handed their trophies down as they had come down from TaG Open to race and felt that those that consistently race the class deserved the trophies more. Across the line in the final it was Matthew from Jorden and Timothy Piper crossing for third, but on the podium it was Timothy Piper on the top step, second step was Jonty Darcy and after a very trying weekend third spot went to Brodie Sward. 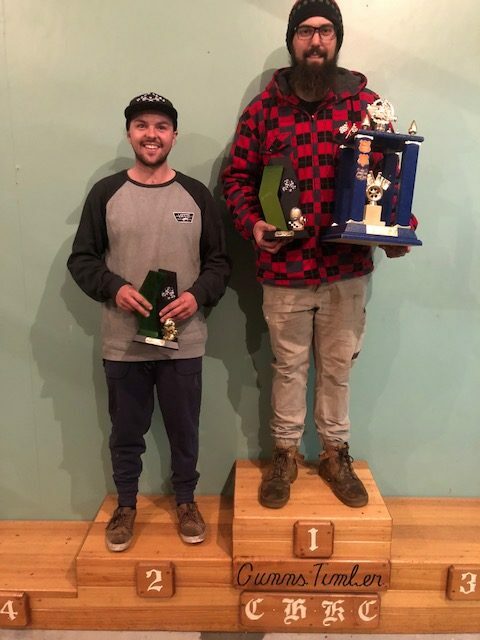 In the Medium class, home track hero Daniel Hinds was kept on his toes all weekend by Matthew Coates who made a comeback after many years away from the sport. But Hinds was able to keep his kart on the track and didn’t cave to any pressure from Coates. Hinds took out first spot on the podium followed by Matthew Coates and Sam Chettle was able to take the third step. Tag Restricted Heavy was the class to watch with local Cohen Wells showing them the way around the track in the wet and taking out his first heat win in his career. Come finals time however, Allan Sheahen just took the win over Wells with Garry Lee in third. The Grant McGlasson Memorial was the feature of the weekend and there were lots of hot favourites. Locals Daniel Hinds and Cohen Wells, the Distill brothers plus Timothy Piper and Jonty Darcy were all names to look out for. As the Lights went out it was Wells who took the lead with Allan Sheahen holding out second. Wells then went a little too hot into the middle hairpin allowing Hinds to shoot to the lead. Hinds lead the field around for all 20 laps taking the win for the 2018 Grant McGlasson Memorial followed by Jorden Distill taking out second and Timothy Piper taking the third step. The Circular Head Kart Club would like to thank all the competiors who braved the weather and travelled down to the race meeting. A huge thank you also goes out to the McGlasson family for allowing us to run a race in memorial of Grant and for sponsoring the trophies, as well as Circular Head Motorcycles, Time Out on Emmet and Auto Brake Services.